In this post I will try the best I can to guid you! 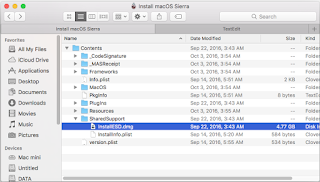 how to create Mac OS Sierra bootable usb drive from your Mac or from any working hackintosh-PC using Disk Utilities. 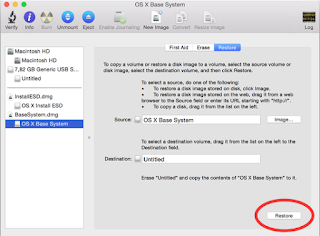 Because since El Capitan the disk utility of macOS was change, if you running El Capitan and want to create bootable usb for Mac OS Sierra you can use Yosemite Disk utility for El Capitan just google it! 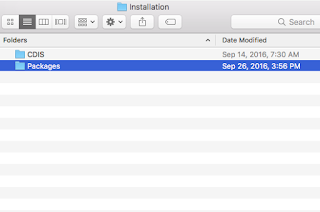 This method also work to create usb installer for El Capitan, Yosemite and Maverick and other previous version of Mac OS X as well. First you need to download Mac OS-X Installer apps from App Store, torrent. If you already have it than its good so you can just start experiment with it. 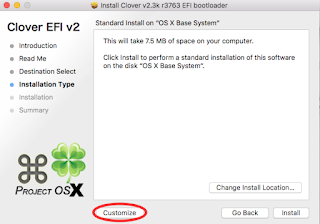 When you done create usb installer with terminal, for the final trick and to make it works go back here and skip this tutorial into Installing Clover boot loader (for Hackintosh) section. You can use 8 GB USB stick except for El Capitan you will need 16 GB USB drive. Important! Make sure you have no important data there because we gonna format it and will delete all your data and will be impossible to restore it back. So back up your data and put it in a safe place before you do this! Now we have to make hidden files show up using terminal command. You will understand what the purpose of doing it later. Open terminal type or copy the command bellow, this command will show you the hidden files. Later you will need to make it back to normal ..so you can use the command bellow to make all hidden files vanish again. 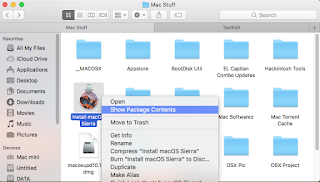 Go to Mac OS Sierra apps > right click > show package contents. Click Content > Shared Support and mount InstallESD.dmg with Disk Utility. open InstallESD archive in finder and mount BaseSystem.dmg. Select the USB drive from the list of disks, select Restore tab and pick select BaseSystem.dmg as a source and USB flash drive as the destination. When ready click on Restore button. After the Restore process is finished, open Finder > open USB drive (OS X Base System) ► go to the System/Installation folder and select Packages file and delete it. 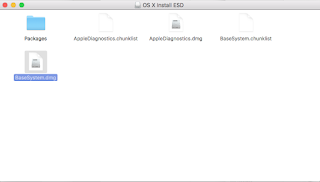 Open OS X Install ESD volume in Finder, select Packages folder and copy them to System/Installation folder on USB drive. 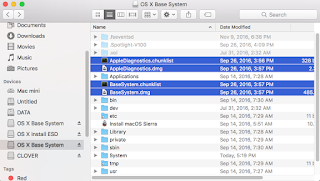 Also copy BaseSystem.chunklist and BaseSystem.dmg files from InstallESD.dmg volume to root of USB flash drive (OS X Base System). NOTE: For using in real Mac computer your USB drive is ready to use. But! 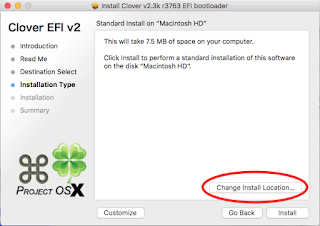 for using it to install Mac OS-X in Hackintosh PC you need to install Clover boot loader on it! 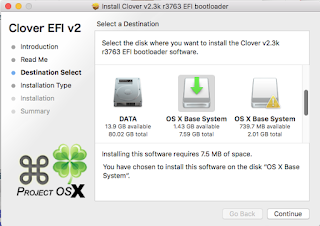 Install Clover and choose your USB drive for install destination. See picture below! After install Clover finish, there will automatically EFI Partition mounted on your Finder-sidebar/Desktop. So! its time for The Tricks! Putting some essential kext like fakeSMC.kext etc. For config.plist you can use pre edited one, along with additional kext I have uploaded. After you download the archive extract it then find and choose one of config.plist you desire inside the config.plist folder. 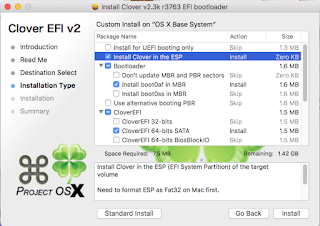 Copy config,plist to mounted EFI partition in desktop/finder-sidebar click on EFI > Clover > EFI > CLOVER and replace existing config.plist there. Then copy all kext from kext folder to Clover > EFI > CLOVER > Kext > Other(for OS Sierra) 10.11(for El Capitan) and so on, to EFI partition. Now your Usb Drive is ready to install Mac OS (X) on your Hackintosh-PC. Important! Before install Mac OS X on PC please backup all important data especially in drive you decide to dedicate for installing Mac. For conclusion and you to taking note that every Hackintosh thing is only for FUN and Educational purpose only. I am not responsible for any damage caused by following this tutorial. Make sure you know exactly what you’re doing and understand for the risk as well. If you really love Mac OS X system you should buy a Real Mac by Apple. 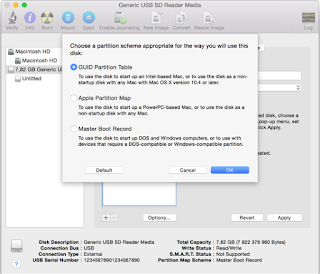 I hope this post could help you to make bootable usb drive for hackintosh and “Real Mac” as well. If you want to discuss something please feel free to leave your comment bellow! image nya ilang yah gan? hi , i have a vostro 1015 laptop . Is it possible for me to run sierra ? Kindly share any information that would be helpful. I dont have any graphics card. I never try it my self, but it could be possible. Without supported graphics card, it may ‘a little hard’ to boot. Mac OS maybe run with awful screen resolution, also the animation and other effect may won’t works like it should be. But you can give it try! file config.plist -nya ga ada ya? boleh tolong linknya? atau ada di halaman sebelumnya yg di create bootable windows? Thanks for your comment brother, happy hackintoshing! Halo lagi, oya, one more thing, what should i do with all downloaded driver files? Its not mentioned to be copied or replace another file.